I finally feel like the transition to spring is here. Sure, we’re still having some chilly evenings, but it’s finally feeling more like it’s warmer than it’s colder. My twice-weekly exercise class made its move from inside the high school field house to an outdoor field last week. The first morning it was 55 degrees, though the second morning, it was 20 degrees colder. It might be time to turn the heat off for the season soon. Now that spring is in the air, the garden is starting to come alive. I still have some snowdrops lingering. The crocus is over, but the first early tulips and my first two daffodils opened this weekend. Chionodoxa has naturalized on the edges of the lawn which makes me smile. Yesterday, I cleared out the herb bed and found the chervil volunteers, chives, and tarragon poking up green shoots. The lemon balm, oregano, mints, winter (perennial) savory, and sage are still dormant, but alive. The thyme didn’t make it, so I will get some replacement when I purchase the annual rosemary and lemon verbena to round out the mix. As for food plants, the gooseberries, currants, and blueberries are starting to leaf out. The raspberries and blackberries haven’t gotten started yet, but I’m sure they aren’t far behind. I forgot to check whether the rhubarb is starting to poke up and unfurl but it should be starting. We planted a bed of peas a few weeks back (under the Remay cloth) but no sign of germination yet. A seasonal change is a change in more than weather but in what we eat. I’m just finishing up the last of our Winter CSA vegetables, storage vegetables obviously. There are still a couple of butternut squash left and a couple of pounds of beets. I used up the last of the beets in a simple but delicious soup. Roasted beets combined with sautéed red onion in chicken stock with a smidge of cream. The whole mixture gets processed in the blender for a smooth, magenta puree. The color is wild. The taste is sweet and earthy and more complex than its short list of ingredients. I’m certainly happy to be saying goodbye to winter, but this soup was an excellent sendoff! Preheat the oven to 400 degrees. Scrub the beets well. Place the unpeeled beets in a roasting pan, add about ½ inch of water to the pan. Cover with foil and bake for one hour or until the beets are tender. When the beets are cool enough to handle, slip the skin off. Cut 1/3 of the beets into julienne and set aside. Dice the remaining beets. Melt the butter in a large saucepan over medium heat. Lower the heat and add the onion. Cook until tender and translucent, about 15 minutes. Add the stock and diced beets. Bring to a boil, and simmer for about 10 more minutes. Puree the soup in the blender until smooth. Return puree to the saucepan. Add the cream and stir to mix in completely. Season to taste. To serve, ladle warmed soup into bowls and garnish with the julienned beets. You could dollop with sour cream, but it’s delicious plain. Posted on 10 April 2011, in Gardening, Winter CSA and tagged beets, gardening, soup. Bookmark the permalink. 5 Comments. Interesting. I’ve never heard of cream of beet soup. Looks good! It sounds like you have a wonderful garden, Betsy! I love the gutter idea – so simple and efficient and it will be so easy to harvest your lettuce and radishes. Your creamy beet soup looks and sounds delicious! You have inspired me to get back into the garden today. Have a good one! will you put another gutter above this one? 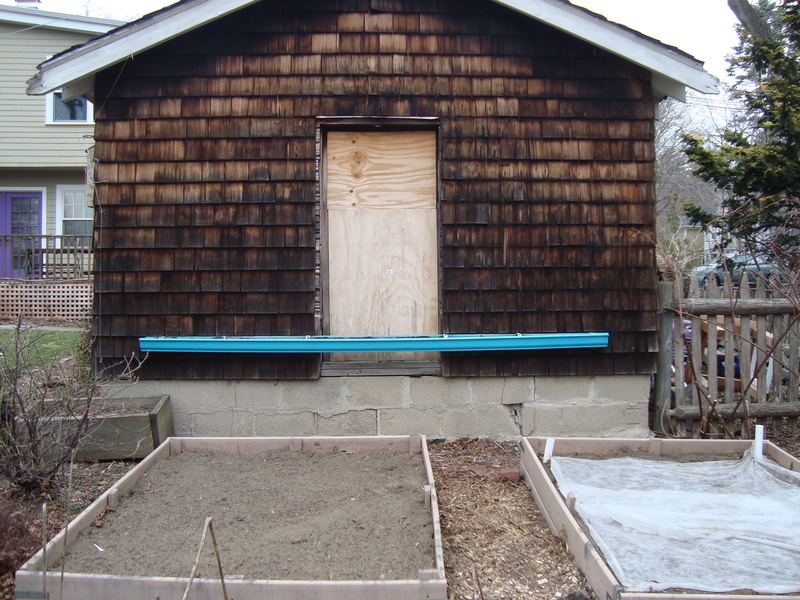 i thought this idea was great because it forms a tight row, less room for weeds, out of reach of most critters and you don’t have to stoop to tend and harvest. brother jeff scoffed but howard and you did it! cool. Betsy, Looks like spring is finally coming to the north-east! After a very long winter it is so good to get outside again. I also love the idea of the gutter. What a great way to take advantage of extra space, and how pretty it should look with the plants in it! Enjoy your spring! 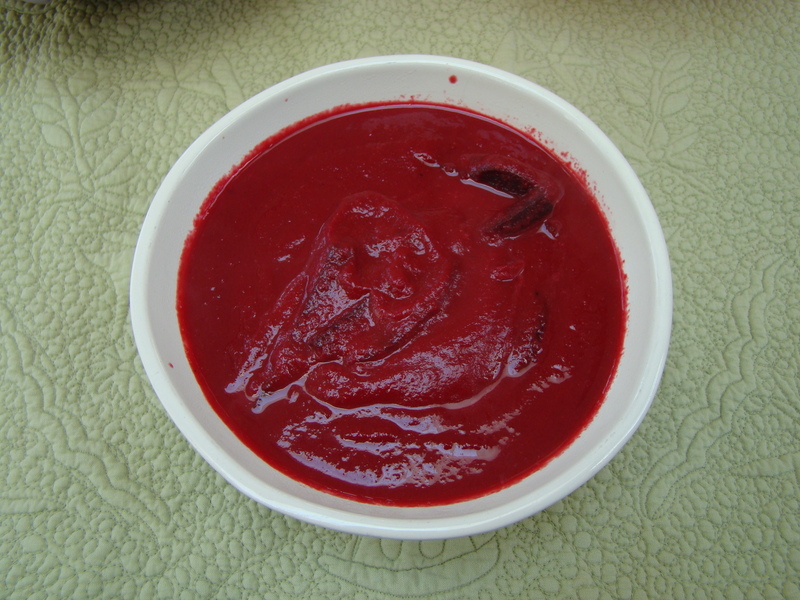 Your beet soup looks great!